If your statistical background includes ANOVA modeling and analysis of designed experiments, you are likely already familiar with contrasts. If not, contrasts may be a new concept, or perhaps you use certain types of contrasts but call them by different names. So before we jump to contrasts with multilevel models, let's look at a few types of tests you can perform using Stata's contrast command. Item response theory (IRT) is often used for modeling the relationship between the latent abilities of a group of subjects and the examination items used for measuring their abilities. Stata 14 introduced a suite of commands for fitting IRT models using maximum likelihood. In this article, we demonstrate how to fit a Bayesian 4PL model using bayesmh. Collect the latest set of five commemorative bookmarks documenting the accomplishments of Thomas Bayes, Vera Nikolaevna Kublanovskaya, Max Otto Lorenz, Andrey Markov, and John Snow. The set begins shipping March 7. Looking to increase your Stata IQ, or perhaps just want an excuse to enjoy a few days in the city that is second to none? You can't miss with the 2016 Stata Conference. 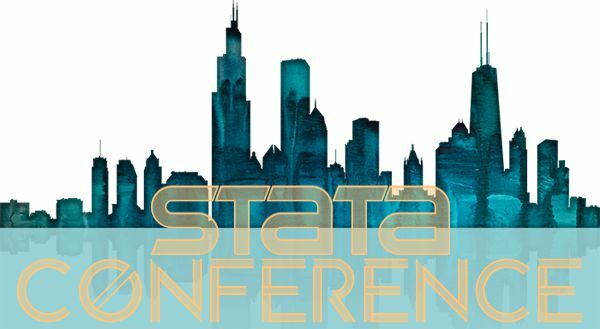 The Stata Conference provides a unique users-group experience, bringing together top researchers from around the world and Stata developers in an intimate atmosphere where everyone is welcome. More dates and locations are forthcoming. Check our site frequently for updates. 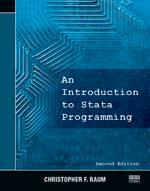 If you want to understand basic Stata programming or want to write your own routines and commands using advanced Stata tools, Baum's book is a great reference. Three of this year's ICPSR courses are taught by StataCorp staff and will be of particular interest to Stata users. The editors of the Stata Journal, H. Joseph Newton (Texas A&M University) and Nicholas J. Cox (Durham University), are delighted to announce the award of the Editors' Prize 2015 to Richard Williams. Nominate your favorite Stata Journal authors for the Stata Journal Editors' Prize 2016.